Serum levels of CA19-9 correlate with recurrence and survival in patients with pancreatic adenocarcinoma; however, little is known about the features and prognosis of pancreatic adenocarcinoma with normal CA19-9 levels. Patients with pancreatic adenocarcinoma (n = 806) were split into two groups with normal (≤ 37 U/mL) and elevated (> 37 U/mL) CA19–9. 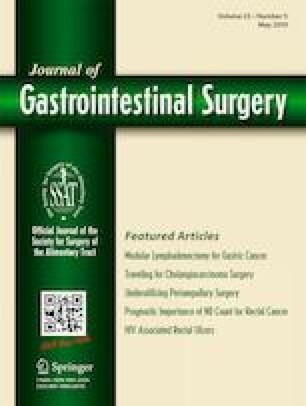 The clinicopathological features, survival, and recurrence patterns were compared between two groups. We also sought to identify factors that best predicted prognosis in pancreatic adenocarcinoma with normal CA19-9 levels, to assist in the selection of the most effective adjuvant treatment. Pancreatic adenocarcinoma with normal CA19-9 were less likely to have lymph node metastasis, angiolymphatic invasion, intrapancreatic neural invasion, anterior serosal invasion, and invasion of the surrounding tissue/organ (distal bile duct, duodenum, or splenic artery or vein). Following propensity-score matching, pancreatic adenocarcinoma with normal CA19-9 levels (≤ 37 U/ml) were associated with significantly superior overall survival following resection. Moreover, the CA19-9 ≤ 37 U/mL group demonstrated a significantly lower rate of local recurrence (35.57% vs. 52.35%, p = 0.004), distant recurrence (42.95% vs. 60.4%, p = 0.003), and mixed recurrence (5.37% vs. 29.53%, p < 0.000) compared with the CA19–9 > 37 U/mL group. Multivariate analysis suggested that angiolymphatic invasion, lymph node metastases, and tumor size > 3 cm were independent prognostic factors for pancreatic adenocarcinoma with normal CA19-9. Survival analyses suggested that post-op chemoradiotherapy or chemotherapy were associated with more favorable outcomes. Pancreatic adenocarcinoma with normal pretreatment CA19-9 levels (≤ 37 U/ml) were characterized by better biological characteristics, reduced rates of recurrence, and longer overall survival. Moreover, optimal adjuvant therapy should be performed after surgery. Yajie Zhao took part in collecting clinical data, reading literature and writing manuscript. Chengfeng Wang was involved in co-supervision, final editing/critical revisions, interpretation/important intellectual content. This work was supported by CAMS Innovation Fund for Medical Sciences (CIFMS) grant number 2016-I2M-1-001. This study was approved by the Institutional Ethnic Committee on Scientific Research of National Cancer Center/Cancer Hospital, Chinese Academy of Medical Sciences and Peking Union Medical College, and informed consent was obtained from all patients in this study. The authors declare that there is no conflict of interest regarding the publication of this paper. And CAMS Innovation Fund did not lead to any conflict of interests regarding the publication of this manuscript.